What are Antique Belton Type Dolls? 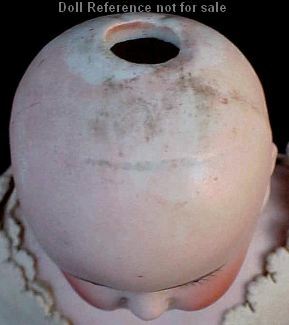 The common characteristic's of Belton-type dolls are: a solid bisque dome head, an uncut pate with one, two or three holes. Belton type dolls are found sized 9 to 24" tall, usually a bisque socket head on a composition jointed body, but occasionally a bisque shoulder head on a kid body is found. 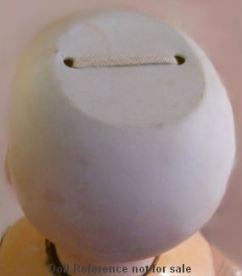 Belton type dolls, usually do not have a doll makers initial or symbol in the marking, only a size number or mold number. Belton-type dolls are not attributed to any single antique doll maker, dolls are probably German, but usually attributed to the French. It's also possible, Belton-type dolls were made in both countries. 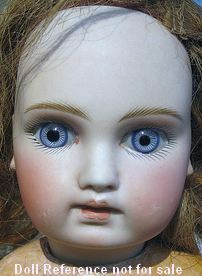 Antique Belton type doll is 14 1/2" tall, has a bisque socket solid dome head with two holes (her full face is shown above), wigged, feathered eyebrows, painted upper and lower eyelashes, glass sleep eyes, closed open mouth, unpierced ears, a Sonneberg ball jointed composition body with straight wrists. Doll is marked with a size number only, number 8. 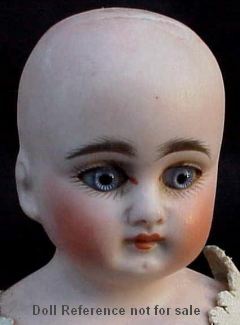 The above antique Belton type doll is 11" tall, has a solid dome bisque shoulder head with one center hole, wigged, heavy feathered eyebrows, glass eyes, painted upper and lower eyelashes, closed mouth, chin dimple, unpierced ears, on a kid gusseted body with bisque lower arms. Doll is marked with just a mold number 106. Note: Belton type dolls are not attributed to any single doll maker German, French or other, hence the dolls are known by the "type" of doll, a Belton.